The National Anti-Bullying Roadshow is an amazing piece of theatre for anti-bullying week. Creative, innovative, energised, powerful, fun, educational and engaging. Loved by teachers. Loved by students. The roadshow is touring the UK and abroad from 4th - 29th November 2013. Book with the leading leading theatre and TIE company dealing with bullying in the UK and winner of the Anti Bullying Flame Award. The Anti-Bullying Roadshow is a creative based theatre production utilising a mixture of styles including song, dance, storytelling, music, science and fun. It is run by the world renouned theatre group Actionwork Theatre, the winners of the Anti-Bullying Flame Award and members of the Anti-Bullying Alliance. The Anti Bullying Roadshow is scientifically based, is proven to enhance and compliment your existing p[olicy and practice on dealing with bullying in school, colleges and the community. The 2013 Anti-Bullying Roadshow is touring the UK and abroad from the 4th - 29th November 2013. The Roadshow compliments the themes for Anti-Bullying Week and Anti Bullying Month. The theme for Anti Bullying Week 2013 is: 'The Future is ours, safe, fun and connected'. The theme for Anti-Bullying Month 2013 is: 'Creatively dealing with bullying using non-violence'. This is the best and most amazing roadshow we have ever created. You will be amazed, you will be entertained and you will want more. The Roadshow is powerful, fun and exciting. 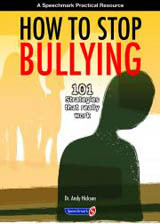 Includes, music, science, strategies and the most up-to-date research and information on bullying possible. The bully behind bullying in one amazing extravaganza. The Roasdshow can be complimented by additional creative interactive workshops - please ask for details. 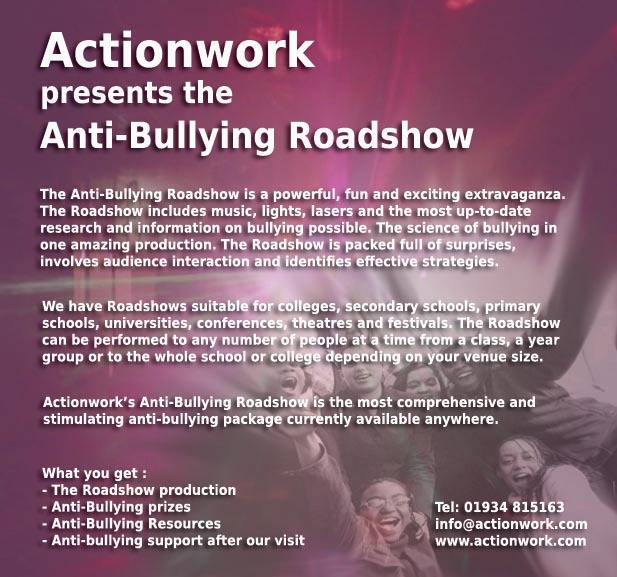 Every year Actionwork produces the national and international Anti-Bullying Roadshow. This tours to schools, youth clubs, colleges, universities and parent groups all over the UK and abroad. Each year we link the theme of the roadshow with the theme for Anti-Bullying Week. Previous roadshows have included: The Science of Bullying, Chronicle of a Bully, Cyber Scream, Clash, and Silent Scream. Our anti-bullying roadshow has been called the ultimate theatre-in-education experience. The 2013 Roadshow is another amazing event. AND - one specialist Roadshow for advanced groups, peer mentors, peer supporters, ambassadors, trainers and teachers. The 2013 roadshow really is a special event. A packed spectacle showcasing a variety of strategies in dealing with bullying and highlighting ways to empowerment. The Anti-Bullying Roadshow is a multi-part package made up of films, presentations, quizzes, interactive workshop elements, lights, prizes sound and some dedicated anti-bullying resources. The Anti-Bullying Roadshow is high impact production that is positive, fun and engaging. It is suitable for main stream and special schools. Each year we have primary and secondary school versions. The Anti-Bullying Roadshow provides an important focus, for schools' anti-bullying campaigns and provides that 'WOW' factor to students and teachers alike complimenting existing anti-bullying work in schools, colleges and community centres. The Roadshow allows schools and other groups to make a strong statement of non-tolerance towards bullying, while giving their students and young people the chance to explore the issues, and the importance of their own role in dealing with it. The Roadshow's dual goal is awareness-raising and empowerment. The secondary school roadshow is suitable for year 6 students right through to adult. The roadshow is gritty, witty, powerful and interactive and does not preach or condescend. There is an element of humour and has a fusion of styles including science, song, dance, quiz, lightshow and wizardry. The roadshow explores bullying from many angles including cyberbullying, face-to-face bullying, violence, name-calling, anger management, friendships, survival, confidence and empowerment. There is an element of audience interaction. A new and original soundtrack has been produced for the show. The roadshow lasts for 60 minutes. The primary school roadshow is suitable for up to year 5 pupils. In 2013 the Roadshow for Primary Schools is geared towards meaning of bullying, friendships, caring for others and some basic strategies for dealing with bullying.There is an element of humour and has a fusion of styles including science, song, dance, quiz, lightshow and wizardry. The roadshow lasts for 60-minutes. The adult, colleges and university roadshow is suitable for age 16+ students right through to adult. The roadshow is gritty, witty, powerful and interactive and does not preach or condescend. There is an element of humour and has a fusion of styles including science, song, dance, quiz, lightshow and wizardry. The roadshow explores bullying from many angles including cyberbullying, face-to-face bullying, violence, name-calling, anger management, friendships, survival, confidence and empowerment. There is an element of audience interaction. A new and original soundtrack has been produced for the show. The roadshow lasts for 60 minutes. The workshop element is incorporated into the Roadshow itself and will include an element of audience interaction. The roadshows offer no solutions. We showcase a range of strategies for dealing with bullying and positive ways of leading to empowerment. We invite the audience to join us in exploring ways to build confidence and raise awareness to help them deal with situations creatively. The message that we are all responsible for the struggle against bullying is central. Time is spent looking at what the word bullying actually means to us. We look at the strategies available for us to use and even try out a few. Some basic skills are provided to help us deal with bullying and cyberbullying. Time is spent challenging bullying and the negative unproductive behaviours associated with it. This Anti-Bullying Resource DVD is given to all schools who book the roadshow and is packed full of tips, role-plays, resources and follow-up lesson ideas. In addition to showing some of the horrors of bullying, we are also given examples of how to deal with difficult situations, bullying statistics, interviews, follow-up work and a host of resources. Every school that books the Roadshow will be given a one-hour anti-bullying lesson plan to help teachers follow-up our visit. The lesson plan will be creative in nature and engaging and fun for both teachers and students. Activities are clearly outlined and will include suggested timings. Please note that we have been succesfully touring the anti-bullying roadshow throughout the UK and abroad for many years now. In the UK we have toured to London and the south-east, Bristol, Devon and the south-west, Birmingham, Coventry, Nottingham and the midlands, Manchester, Liverpool, Leeds, York, Warrington and many other parts of the North, Glasgow and Scotland, Cardiff, Swansea and Wales, Isle of man and Northern Ireland. “Excellent programme, it was great that you reinforced good practices” Damni McCulloch, Christs Hospital Schoo.